This is part two of the walkthrough, which guides you through Chapter 7 to the end of the first episode. So after getting through Chapters 2 through 6, you are ready to play through the rest of Episode 1. 1. This chapter starts when a group of people saves you from the zombie. In the previous chapter, you were bitten by a dog, but the strangers do not trust you. They lock you in a small shed just in case you turn into a zombie the next day. The strangers will not help you cover the wound, so you may have to find a way to solve the problem yourself before the situation gets worse. In the shed, you will find a fishing line in the tackle box and a hammer. These two items are very important, especially the hammer. Getting the fishing line is easy. However, Clementine is too short to reach the hammer on the high shelf. In order to pick up the hammer, unfold the small table, and climb on it to get the hammer. Once you have these two items, go to the corner of the shed. Try to pull out the board using the hammer, and go outside. 2. Clementine will need a needle, peroxide, and some bandages for stitches. All of these items can be found in the house. However, it is not easy to get into the house without anybody noticing. Walk around the house until you find a hole covered by plywood. Use your hand and the hammer to pull it out. Next, go into the hole, and you will find a trap door. Use the knife to open it. Once you are in the house, get to the second floor using the stairs on the left. On the second floor, you will see two bedrooms and one bathroom. The needle is inside the bathroom. Peroxide is in the opposite room, and the bandage is in the other bedroom. In the bathroom, you will find the needle inside the medicine cabinet. When you leave the room, someone will come in. Find a place to hide quickly or you will be spotted. In the first bedroom, you will meet Sarah. Be nice to her, and she will give you some peroxide to clean the wound. The last item, the bandage, can be found on the table in the other bedroom. When you have collected all the items, exit the house using the same way you got in. 3. To sew the wound, hold down the left mouse, and move it to the right. Repeat the action until the sewing is completed. 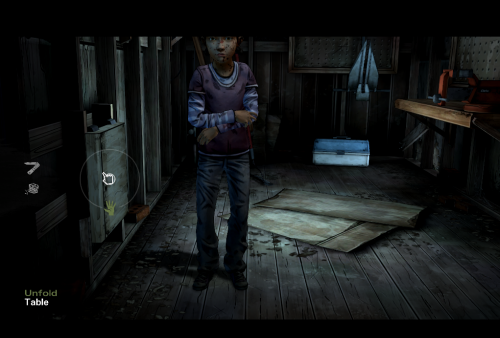 When Clementine drops the bandage to the floor and tries to pick it up, a zombie will try to break in. Use the bricks and the rake to prevent it from getting close to you. When the zombie is stuck, use the hammer on the table, and hit it until it is dead. This chapter contains only questions, so we will not cover it here. 4. When you are on the way to the fishing trap, you will find many dead bodies. Uncle Pete will ask you to check out the bodies to see if you can recognize anyone. Choose the one on the other size of the river. Get to that side, and investigate that body. You will eventually find Clementine’s bag.